I’m far from a Luddite. I have a laptop, two websites and a blog, a Facebook profile, do the majority of my reading on a Kindle, use digital cameras and rely on my mobile phone almost exclusively for communication. Without these technologies I would be hard pressed to manage the range of work I do, especially from our remote rural studio. While I depend upon a host of internet-based, wireless and digital media to increase efficiency and decrease redundancy and waste, I’m not particularly enamored of any of them aesthetically, and devote as little time as possible ‘interfacing’. As a maker, the majority of the work I do outside of the studio consists of writing and drawing by hand in a notebook. Next to the pencil, the notebook is by far my favorite tool, the bridge between ideas and their kinesthetic manifestation. To me, giving shape to words and objects by hand, on paper, is a way of embodying ideas in their germinative phase, connecting the senses to the brain by way of the hand. In the hierarchy of skills required to design and make anything, a good notebook ranks high as an indispensable adjunct to craft. 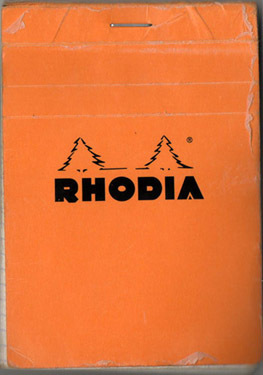 Over the years, I’ve transitioned from Moleskin to Bienfang, experimented with index cards and post-its, but have been loyal to the Bloc Rhodia Number 12 for at least the past six or seven years. The books hold up to daily stowage in my back pocket, where they fit snugly without causing undo concern for the spine. The paper is smooth vellum, and individual sheets are securely bound but perforated for easy tear-out, with a light graph at just the right scale. The paper takes well to pencil, with minimal smudging, and inks do not bleed through. Better still, the notebooks can get completely soaked and will dry out with little effect. Best of all, the bright orange cover always cheers my day. Posted by Scott on January 6th, 2011, at 9:05 pm, and filed under aesthetics, all, Best Posts, daily handwork, studio process.